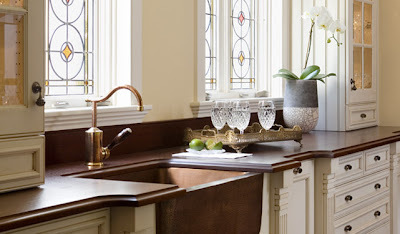 Kitchen and Residential Design: Reader question: What color appliances go with a copper sink? Help! I read your blog all the time but I never wrote to you before. I like that you tell people what's on your mind. I can take it. My partner and I are building a new home and we would LOVE to have a copper sink. What I can't figure out is what color of appliances I should get to coordinate. The cabinets will have a darker maple finish. Please advise. Well good, I'm glad you been on this site before and I'll do what I can. The easy answer to your question is that you should get the color appliances you like. There's no rule that says metal finishes have to match. In fact I say they look better when they don't. Everybody you talk to will have a different take on this, but you wrote to me and here's what I say. 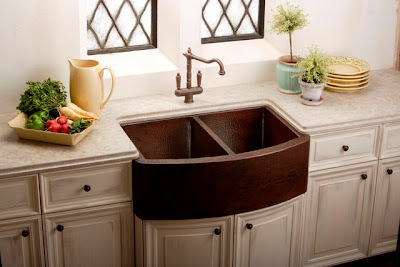 Working a copper sink into a kitchen design involves more than appliance colors. Don't get me wrong; a well-made copper sink is a lovely, lovely thing. It's just that they're not very subtle --they are a scene stealer so it's best to let it be the focal point of your kitchen. It sounds like you haven't selected the actual sink yet, so look for an apron front sink like the ones I'm picturing along with this post. Get a natural-looking patina on the sink you buy. There are all sorts of wild patinas you can get on a copper sink, but go basic and classic. Get stainless appliances, stainless steel is a classical finish in a kitchen and it's also a neutral. In going with stainless appliances, you now have two metal finishes in this kitchen, so keep going. 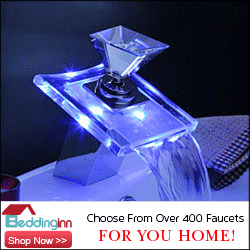 Find a third and use it for your fixtures. Most manufacturers' oil-rubbed bronze finishes have a lot of copper color in them, so an oil-rubbed bronze faucet will work perfectly. When you go to look at knobs and handles you'll now have three metal finishes to choose from, but hardware that comes close to the oil-rubbed bronze finish of the faucet will be the easiest to find. That doesn't mean that you can't use the color of the steel or the color of the copper when it comes time to picking hardware. What's important is that what you're doing make some kind of sense, it should tell a coherent story. Long story short? Let your copper sink have center stage and get stainless appliances. You've convinced me to go with Balanced Beige. I want all the changes to the kitchen to really stand out!! I'm glad to hear it Kelly, you will love that color! Jenn Air and Amana were playing around with a copper tone applied to stainless steel a couple of years ago and I'm not sure if they are still making it. Here's a thought, Get copper colored pulls for fridge, dishwasher, oven, ect...to accent a copper focal point such as copper sink, range hood or copper counter top. I am going for it. Thanks! I'm giving my kitchen a facelift, but can't afford to replace appliances. They are white. I'm looking at jurassic green granite for the countertops and was looking at an apron front sink. Cabinets are light and my home is victorian. Question on whether to go with a white sink or would cooper/bronze finish look nice as well. Thanks.